Photo courtesy of the Passau Pirates. Think for a minute about college football in the United States. Player ages typically range from 18 to 22 and, while they are still developing, they’re in the prime of their physical condition. A certain level of passion distinguishes this demographic from others – their love for the game is the driving force behind the hard work they put into becoming bigger, faster, stronger, and overall, better. College towns such as Ann Arbor, Athens, and Tuscaloosa are completely enamored – obsessed even – with their hometown teams that take the field on fall weekends. Notable players feel like mini-celebrities walking around town among people hopeful for a picture, autograph, or even a sheer moment of eye-contact. American football in Europe is different. American football in smaller cities in Europe is different. American football in small, university towns in Europe is just different. Players come from all over, sometimes from outside the country and even outside the continent. Instead of being a scholarship athlete, they play the sport simply as an extracurricular hobby. American football is still a minority sport in Europe, so players must get used to playing second fiddle to soccer teams even for field space and availability. Imagine attending classes during the day and practice in the evening – balancing the writing of your thesis in mechanical engineering and learning your offensive playbook simultaneously. These are real life situations that players pay for. Maybe you didn’t catch that. These are real life situations that players pay for. No monetary compensation in return, no scholarships, no celebrity-status outings in the city. Just for the love of the game. The nobility is compelling stuff. Perhaps no team in Europe better embodies this ideal than the Passau Pirates. Passau is a town in the southeast corner of Germany, situated on the Austrian border and less than 60km from the Czech border. The town’s population is about 50,000, nearly a quarter of which is made up of students from the University of Passau. Therein lies the epitome of a small college town. American football has been around in Passau for a few decades. In 1987, some students at the university founded their own “college team”, the Passau Red Wolves. A couple of years later in 1989, the Passau Steelers were created to offer non-students the opportunity to play the new sport. Although both teams enjoyed considerable success over the course of the next decade, the financial deficit each team faced forced both teams to wave their proverbial white flag and call it quits by the late 90’s. Another decade had passed in Passau without American football until the fall of 2008 when Florian Schneider, a German-born player with an American father, posted an ad in the local newspaper calling for the founding of a new club in the city. Florian had played previously in Kaiserslautern, a city in southwestern Germany near the French border, but had recently relocated to Passau with his family. Suddenly handfuls of former Red Wolves and Steelers emerged like phoenix from the ashes looking to get involved with the development of the new team. This is where the Passau Pirates were born. Things started off slow for the Pirates. 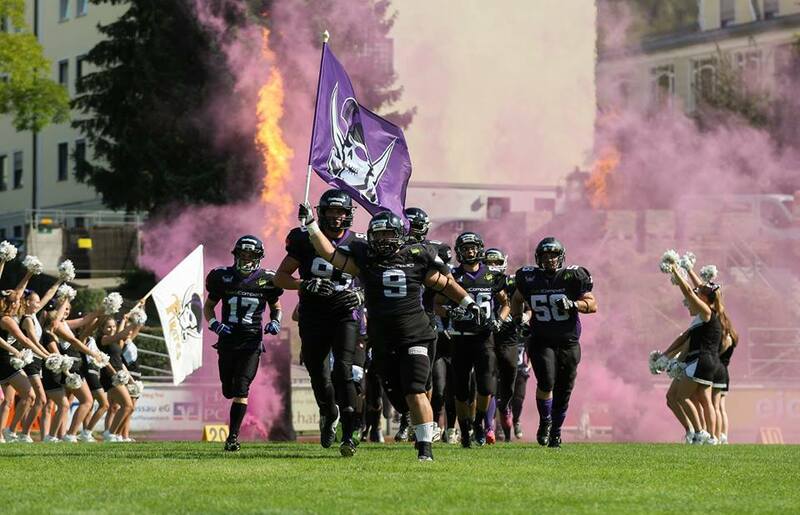 In their first season in 2009 the Pirates competed in the Aufbauliga Bayern, southern Germany’s seventh division of American football. Not only did the team go winless in that first year, but they failed to score a single point. The only way to go from there was up for the Pirates, who steadily progressed and eventually ascended to the Bayernliga (fourth division) by 2014, where they remained for a few seasons. In 2017, a 24-year old quarterback from Southern California took over the program with no prior coaching experience. Balancing head coaching duties with quarterback duties is quite a tall task, especially when you factor in his youth and inexperience. Shattering stereotypes and expectations, Andrew Griffin led the Pirates to an undefeated season that culminated in a lopsided championship victory. The Pirates defeated the Hof Jokers – who were successful in their own right with a 10-1 record heading into the game – by a score of 46-8. This win propelled the Pirates into the Regionalliga (third division), where they will compete in 2018 for the first time in club history. The Pirates’ pass-heavy offense featured four rookie wide receivers, all of which caught multiple touchdowns on the season, and all of which are university students. With a learn-as-you-go mentality, the Pirates’ offense showed steady improvement throughout the season as the young players gained more understanding of the game and developed chemistry with one another. Defensively, the Pirates were slightly more experienced. Led by veterans Flo Schneider, Julian Riedlinger, and Thomas Ochmann, the defense only gave up 17 points per game last season in 2017, good for best in the league. With such a unique demographic comprising the roster, Griffin wanted the Pirates to focus on three things: fun, fast, and smart. The aforementioned “finishing touch” might refer to the process that was put into action last season. A team’s “process” is a term aggressively floating around the coaching world today. Several prominent coaches, most notably Nick Saban of Alabama, have recently talked about their team’s “process” and what that means to the culture of their football program. With over 1,500 football teams spread throughout Europe’s 41 football-playing countries, many arrive at success in a variety of fashions. Some plaster goals across their locker room walls or have goal charts for drives, games, or seasons. Others simply focus on habitually doing the best they can. When asked about what his goals are for the 2018 season, Griffin admittedly accepted the notion that a championship would be nice. When asked to elaborate, Griffin flashed a quick smile and a subtle laugh.